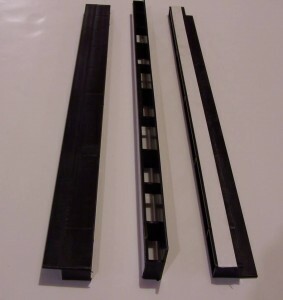 You are here: Home » What are EZ-Strip™ Spacers? EZ-Strip Spacer™ is easy to use with a pre-installed super strong double-sided tape. 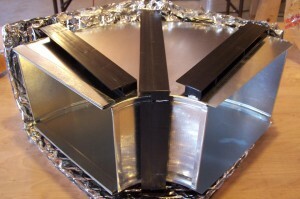 Big Dog Americans™ EZ-Strip Spacer™ System insures the ducts integrity from its continuous rail open truss design down the ducts edges and will provide a solid base to hang the ducts or run them across the attic joists. EZ-Strip Spacers™ open truss design provides a continuous air space around the duct, fittings plenums, round or spiral duct. When you need more insulation support for larger ducts just add an EZ-Strip Spacer™ down the center to insure the insulation doesn’t lose its integrity and collapse the required air space. The EZ-Strip Spacer™ system is the New Industry Standard for Insuring the Ideal Required Air Space. Each EZ-Strip Spacer™ is 2 ft. long and comes 20 strips to a box.